The clients can avail from us the premium Rubber O Rings in varying sizes, materials, and qualities, to suit different static and dynamic engineering applications. The Rubber O Rings can be seated in a groove and compressed during the assembly between two or more parts. Our Rubber O Rings protect the specifically designed gland against chemicals, cryogenic conditions, and high temperatures. 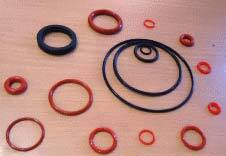 Furthermore, our Rubber O Rings complement varying sealing devices and gaskets.